"Toward a Global 'Thin' Community re-examines aspects of the liberal-communitarian debate. While critical of both traditions, this book argues that a coherent form of communitarianism is the only plausible option for citizens today. Using the theories of Friedrich Nietzsche and Michel Foucault, Olssen shows how we can overcome traditional problems with communitarianism by using an ethic of survival that he identifies in the writings of Nietzsche and others to provide a normative framework for twenty-first century politics at both national and global levels. 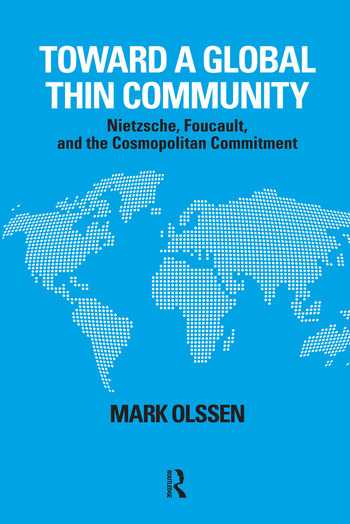 "Thin" communitarianism seeks to surmount traditional objections associated with Hegel and Marx, and to safeguard liberty and difference by applying a robust idea of democracy." 2. Understanding the New Nietzsche; 3. Michel Foucault as "Thin" Communitarian; 4. Building Democratic Citizenship: Globalization and the "Third Way"; 5. Frederic von Hayek and Global Governance: On State Sovereignty and Legitimacy; 6. Totalitarianism and the Repressed Utopia of the Present; 7. Multiculturalism, Diversity, and Equality; 8. Education and the Issue of Autonomy; 9. Invoking Democracy: Foucault's Conception; 10. Conclusion: Education and Justice in a Global World.